I think I may be imposing my western view-point on others... but this quote struck me as beyond ridiculous. Quote: In many countries, the penalty for this sort of killing is still softer than for other kinds. Jordan's parliament has repeatedly blocked a law that would impose harsher penalties on men who kill their female relatives for the sake of honour; the lawmakers say it would encourage adultery. Reaction: So, to avoid adultery, we should have laws that encourage murder? Oh well. I decided today, for the umpteenth time, that I would keep my head down and not worry so much about the wider world. This ostrich-like reaction is both good for my emotional well-being, and good for encouraging local action that can improve the lives of people you know, rather than worrying about others you don't. Of course, ignorance is also the root of many evils. Some days I want to fix the world, other days I'm overwhelmed by the magnitude of it. Mood: A good tired. Too tired to think too much. These are the days where it's easy to buckle down and accomplish mundane tasks. Listening: Cubs vs. Phillies in the seventh. Cubs 8, Phils 3. Reading: The Beckham Experiment. I'm probably an hour or two away from being finished. The magazine excerpts were more intriguing than the book turned out to be, but not bad. Probably should have waited for the Library copy. Fire: As I mentioned the other day, they won their last game 2-0 over San Jose. They're top of the Eastern Conference with 28 points, and third overall in pursuit of the Supporters Shield. Houston has 32 points. Seattle has 28, but the tie-breaker, apparently. Cubs: Entered the All-Star break at .500, swept a 4 game series from the Nationals, and lost two to the Phillies. So, we're 47-45 and 2 games back of St. Louis. Around the web: I wrote a guest article for MyWrigleyville.com. Check it out. Dog: I emailed an IT breeder yesterday with a bunch of questions. I'm still feeling out the breed. Some days I'm sure I could handle it. Other days, I give in to the ominous warnings and get discouraged whether an Irish Terrier is in my future. I did find an IT Blog that made for some great reading. Finally, I emailed the volunteer coordinator at the Anti-Cruelty Society to see if they need a hand walking some of their pups. Still have made no progress toward selling my condo. That Britney Spears is hhhhhot! One of my favorite memories from Viking Press was when Britney Spears first made her entry onto the pop stage and Steve Clark would always go on about how hhhhhhot she was. Well, Steve, this is what happens when a hhhhhottie ages. On Saturday, I took a short training ride to prepare for Coast to Coast Wisconsin. When I got back, I had 40 minutes to eat, shower, and get on the CTA for my ride down to Toyota Park. So, I ordered some Pad-Thai to-go from Ruby of Siam and picked it up at the end of my ride. I paid for the food with my credit card, put it back in my wallet... and then I can't remember. 35 minutes later as I was walking out the door to go to the game, I realized that I didn't have my wallet. Hours of searching (and cleaning) the Keep later, plus retracing my steps to Ruby of Siam, and my wallet was still no where to be seen. I'm completely dumbfounded, but have begun the process of replacing the contents of the wallet. How frustrating. Oh, and the Fire game that I missed? They won 2-0. That was nice. I'm watching the All-Star game. It's 3-3 in the seventh inning, so the NL could still possibly win the game. They haven't won since I was 15. Anyhow, with the ASG game on, I was thinking about last year when I thought the NL had won as I went to bed at the Stone of a Beach youth hostel in Rio de Janeiro. So, reaching back into the photo album, here's a video and some pics. Wyatt shows off his talents as we take a small snack at a cafe next to a Rio Samba club. Just considering a few things I love. United Breaks Guitars - posted four days ago, seen 1.6 million times. Proletariat Unite! I just love that United thought they could save a couple hundred bucks by giving this guy the run-around... and for a few hundred bucks they've bought themselves years of horrible PR. This song is so catchy and folksy. This will hurt them for years, and all it took to fight back was a You-Tube video. I just love how the internet evens the playing field between the powerful and those who have been wronged. Gee, I wonder if these two things have any other applications in my life... hmmm... I'm getting an idea... I'm really tired of the Preposterous. In other news, ashamed, United Airlines offered to pay for this guy's guitar. He told them to give the money to charity. 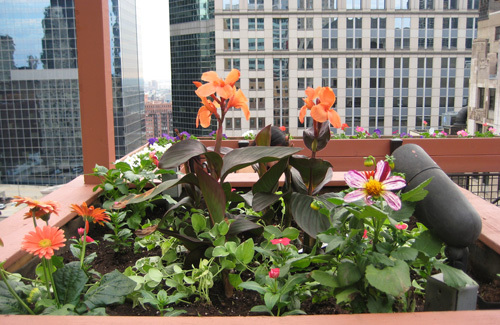 A few weeks ago, our Condo board decided to save about $6,300 by planting our own rooftop flower beds rather than hiring a service. I went up to help with the effort and ended up having fun planting three flower beds full of flowers. Continue reading Pictures of summer. I'm back from my 4th of July trip to tiny pop (Minnesota). We drove back from Minneapolis yesterday and I spent a lot of time staring at the road map book. So, with a little free time over lunch, I've prepared a climate comparison table. What's most striking to me is how comparable Indianapolis and Albuquerque are. So a new motto for Albuquerque: "We're like Bloomington, IN - only warmer, drier, sunnier, and higher."